We are in Cubillos del Sil, north west Spain. In spite of the forecast it's not raining. We are in a comfortable bungalow. The bikes and ourselves are in good order. It's not bad at all this holiday malarkey is it. However much as it pains me to say, all good things must come to an end. I can already feel the end is coming. I'm thinking about our next moves. Today is Thursday 31st May. We need to be in Santander to catch the ferry on Sunday 3rd June. We're about 220 miles from Santander. The ferry isn't until mid afternoon, theoretically we could just stay here until Sunday morning and still catch the ferry on time. But I don't think like that. Not at all. I'd worry I'd get us lost. I'd worry we'd have a mechanical failure en route. Simply put if I stay here until Sunday morning I'd end up incredibly stressed and panicking like a politician who's just left some secret documents on a train. I'd like to be in Santander on Saturday night. I'm reckoning on an easy ride east. 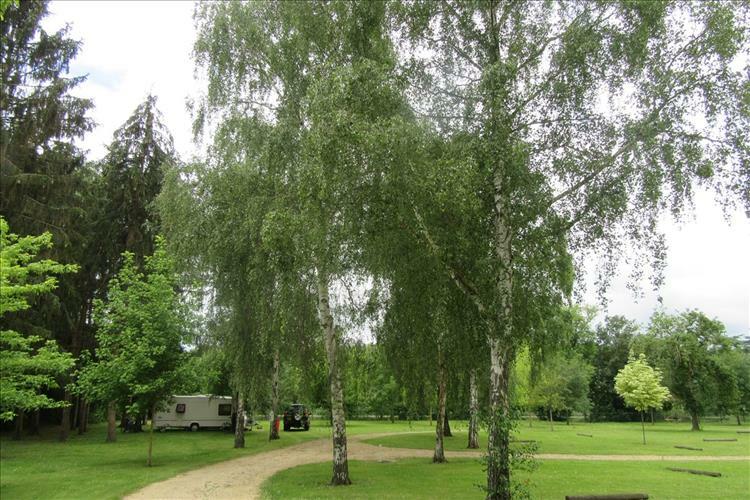 I've found a campsite that looks pretty good just outside La Vecilla de Curueño. That's about 90 to 100 miles away. 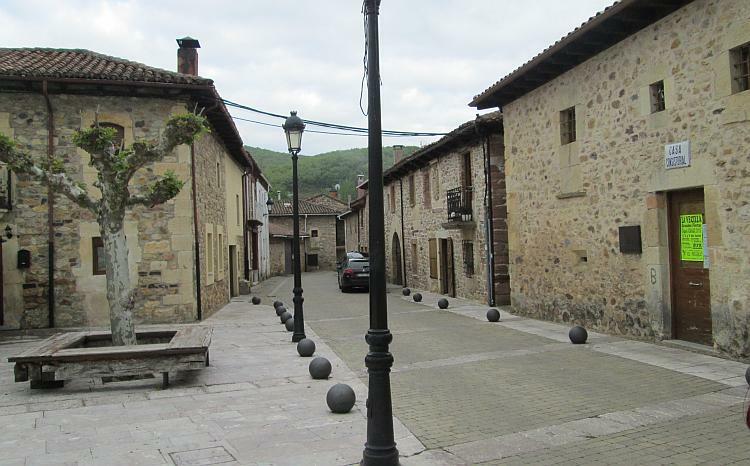 Then we'll go to Potes on Friday as we liked it there, then Santander for Saturday night. Sharon accepts my plan and we pack up once more. It's a shame to be leaving the comfort of the lodge, I mean cabin, I mean bungalow. Yesterday's ride around the hills north of the cabin, sorry bungalow, was worthwhile, informative and enjoyable. We're going to head back up that way and just a little further north because we have time, because the weather looks (oddly enough) OK and because we are here to explore after all. We ride north along the CL631 and pass all the industrial and gritty towns once again. Taking a second look at them today they seem a little less gritty and a little more, well, Spanish. Maybe it's my mood, maybe I'm just adjusting, maybe I don't know why. On the road once again and the skies are grey this morning. Aaaaaah riiiiiight. The furthest north we reached yesterday was where the LE711 joins the CL631. When we pass that point and ride into new territiory I feel the hills growing, the road opening out and the grittyness fading away. The Sierra De Ancares seems to have a lot more to offer than I expected. When we reach Villablino I find a superstore, a "Gadis", we've not come across this name before. We purchase supplies and some odd, unknown pasty style things, I have no idea what's inside them but they taste OK. The CL626 east from Villablino will now be our guide for the next couple of hours. Well someone likes here little Spanish pasty. This road is different. The corners are long and genteel and we can maintain our 90kph speed without issue save for the occasional villages and junctions. After the gnarly feisty roads earlier in our trip you'd think this might be a disappointment, far from it, far far from it. Beautiful hardy scenery, and a concrete telegraph pole. Here we're allowed to sit back in the saddle and marvel, for once again the countryside has become beautiful and the hills have expanded into mountains with rocky outcrops. There's a twist, this time there are vast valley floors with deep green grass, hints of agriculture and sleepy villages off to the sides. With so little traffic and only easy bends it's time to throttle off a little, to ease through rather than whizz by. When the CL626 reaches - ahem "Embalse de los Barrios de Luna" (Reservoir of neighbourhoods of the moon!) its mood changes. The corners are returning, fast and sweeping as we follow the edge of the water. There's something magical about mountains, there's something that draws me to water, hence there's an extra something about mountains and water side by side. I guess that's why I love The Scottish Highlands, I guess that's why I'm so happy to be here right now. Luckily we're not on the motorway today. The corners, the tarmac, those rocky bits, the reservoir, the skies, the greenery. I just keep on looking and riding and smiling and and and and and... I don't want this to end. I philosophise to myself that if I lived here I wouldn't appreciate it as much as I do right now. I can philosophise, but it doesn't stop my heart from yearning. We have to stop. We have to keep stopping to take it in and of course take pictures because I write a blog you know and pictures mean I don't have to try and describe things which requires a lot of boring writing. Sorry, desculpe, I mean I have to take pictures to treasure and to look back on when I'm an old man. I mean how's a chap supposed to accurately describe this? I kind of worked out that we would, but we're approaching the damn where I turned around when I got lost 2 days ago. I'm pleased about this. I could see it was splendid 2 days ago but I was not in any frame of mind to appreciate it. Today I am much calmer. Today I am much more comfortable and settled in my own skin. Today I can enjoy it. We pull in for more pictures. There's a biker in the layby and I greet him with an "Oh-la", he responds in kind. He's local in as much as Leon is local (50km away). He's asking about motorcycle touring in the UK and if there's anything worth seeing in "Bowltoon". Nah mate, avoid Bolton. If you've got this in your back yard I'd just stay right here. I'd stay right here if I were you pal, lucky git. You'll not be finding this is Bolton. We roll down the hill to La Magdalena and I shiver as we pass the toll booth we came through 2 days ago. 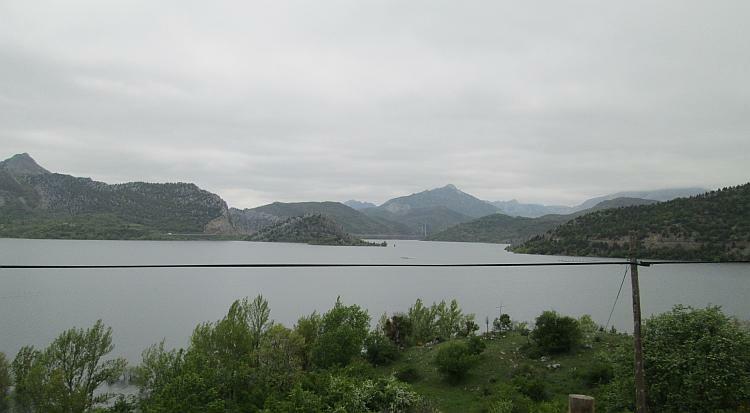 Beyond La Magdalena the jubilant reservoir and spellbinding mountains have gone, replaced by softer hills and typical Spanish villages. It's not too far to the campsite now. 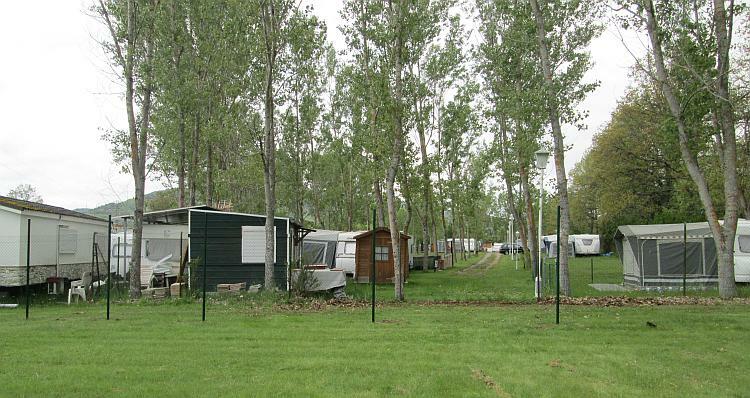 Camping La Cota is not quite as delightful and crisp as the images on their website suggest. I know what the problem is, we are still officially out of season this being the 31st of May and the season starts - ahem - tomorrow. It is open though, I think. I hope. I don't sense this place has fully come to life yet. Within the cafe bar 4 people stop their conversation as we enter and look at us, shock in their eyes. For a brief moment Sharon and I are the strangers walking into a dusty bar in Mexico (Me-ghi-gho), the locals stop to see what's about to go down. In fact I'm temporarily stunned myself as panic flashes across my mind, what have we walked into? This probably lasts half a second, it feels longer. Then "Ohla!" and a lady jumps from her stool to greet us like long lost cousins returning from Peru. After explaining why we're here ("camp-eeeng?") we're suddenly best friends to the 2 ladies and 2 gentlemen. They speak next to no English, but my limited Spanish is improving. We're offered alcohol, I explain we don't drink to their surprise so we're given tea and a nibbles (tapas?) of bread, cured ham and cheeses. Wow! I ask about camping prices, €23 for the night which is average. The lady points to another item on the list showing the outline of a caravan for €30. Hmmmm, it could be cold tonight and we rather enjoyed being in the bungalow. The finances are working out OK so far, we can afford it. We're invited to inspect the caravan with a little help from Google Translate. She leads us to a caravan out on the site. It's old. It looks like it was made in the 80's or 90's. It's been closed up all winter judging by the damp, musty smell. It's small. It's stinky. It's ancient. 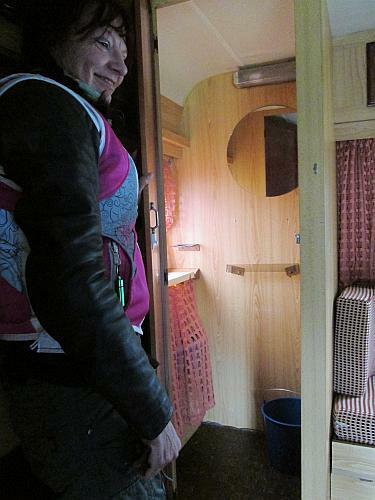 The lady very proudly points out the portable TV, the electric points, the tiny table and the fridge in the awning. 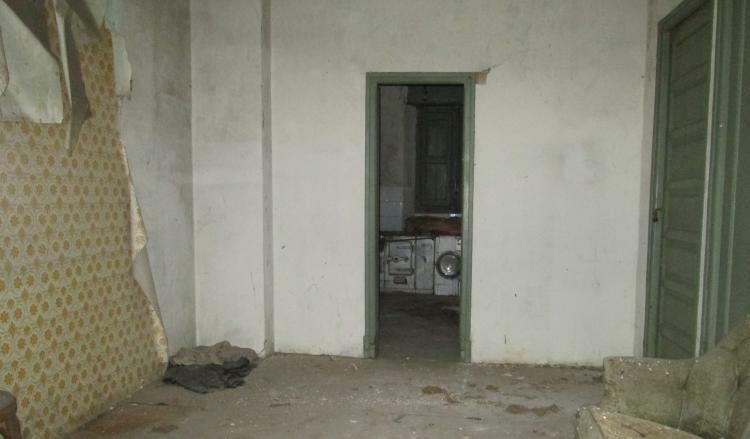 I spot a bucket where there may once have been a toilet. I spoil Sharon I really really do. Your bathroom madam, nothing but the best for you my dear. The next caravan is equally as bad. I look at Sharon, she at me. We're trapped aren't we. These people are our new bestest friends ever and it would be rude to turn down their generous offer of a warm, comfortable, luxurious and affordable caravan. But I know Sharon, she won't take any nonsense. She'll put them right. Hell she'll even ride away if she's not happy. Citizen Parker is obviously not here today, Sharon isn't fighting the righteous fight and as for myself? I've always been a big wimp when it comes to confrontation. We settle on the first caravan as it has a heater. Oh lord help us, what have we done. Once we've unloaded the bikes into the faded awning we get changed and take a walk into the local town of La Vecilla de Curueño. It's a nice village, in that Spanish way. At the edge of town are a handful of large almost mansion sized properties with land. A few are crisp sharp fresh and immaculate, a few are averagely habitable, several are uncared for and a few are in ruin. We poke our nose through the broken door of one ruin, it needs work but it's a crying shame it's not being used. Some of the houses are gorgeous. And some are left to ruin. Shame. The centre is more complete. There's still the odd crumbling abode but we can live with that. It's calm, it's pretty, it's old in places and the new buildings are complimentary. I like it and I feel relaxed here. I insist we stop at a bar for a glass of pop and to just sample the local life here. Oh, and to avoid going back to the caravan. La Vecilla de Curueño is a lovely little place. Back at the campsite I talk, as best I can, to one chap. He lives here over the summer, he can't work full time as a truck driver any more due to illness or injury, it's hard to understand. He has a motorbike but there seems to be some restriction that he can only ride 20km due to his ailment. He does help out as best he can at the campsite though. When we switch on one of the lights the power goes out. I find the lady and she shows me how to reset the power on the box near the caravan. When we flick the switch it happens again. Don't use that light Sharon. When we go to bed we switch off another light but that continues to blink and flutter even with the power off. Oh poop, I hope the caravan doesn't set alight in the middle of the night. Building Up To España In the prologue to their journey Ren can't help but feel that the forthcoming journey might be a costly disaster. Forever the optimist. Getting Ready For Spain Sharon is determined to be ready, organised and prepared for her forthcoming trip to Spain. However life is even more determined to ruin her plans. Bodging Daaan Saaaf Ren bears witness to an impossible event. Then there's some last minute bodging to be done. Motorway Miles And Muses Sharon's derriere proves more than tough enough for the big ride across England. Can she manage to lose them emotional luggage while securing her physical luggage though? To The Ferry What are the chances of Sharon getting out of bed very early twice in the same week. Well she'd better had otherwise the Muppet's will miss the ferry. Ocean Blue Sharon's more excited than nervous but this is the first time the Kwakker has been aboard ship. That's if customs let her on board. 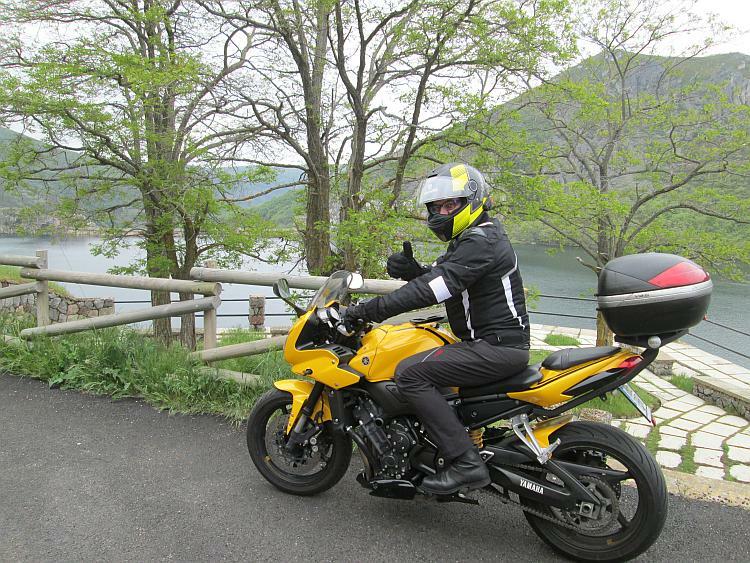 Lost Off The Ferry The great adventurer and motorcyclist Ren is proving that he is in fact a useless idiot. He can't ride and he can't find a campsite that is open. Oh what will become of the BAT muppets? Campsite Conundrum Sharon is having way too much fun while Ren is trying to find a place to sleep. Well someone has to be happy when Ren's such a grump. Discovering The Picos After a troublesome first day in Spain hopefully Sharon and Ren's luck will improve. Thing is they have a 187km detour to reach their destination. There have been worse detours though. Heaven's Mirror Putting fear and doubt to bed for a while Sharon enjoys the wondrous ecstasy of nature and the joy of riding a motorcycle through it. Oh and a lot of sharp corners too. Rain In The Picos Will the rain bring doom and gloom to the already grumpy Ren? Luckily there's enough scenery and interesting things to keep him going. The Sound Of Silence In spite of a dire weather forecast Sharon's day in Spain is filled with the beauty of nature, fond memories and the creation of great new memories. 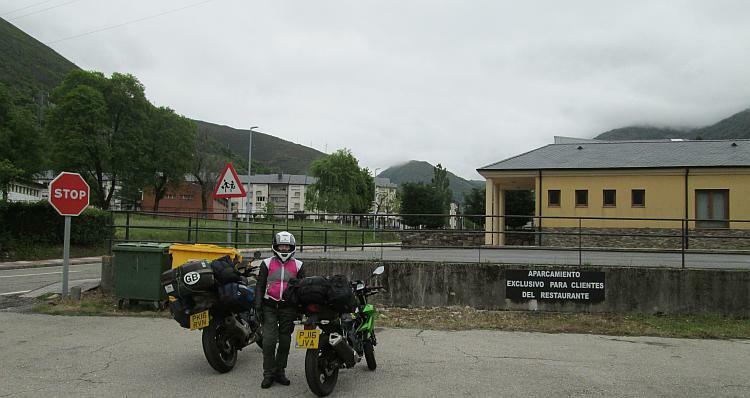 Riding to Burgos Is motorcycle touring a non stop stream of excitement, beauty, wonder and exploration? Erm, nope. It's a rather ordinary day on the road to Burgos. Tin Tin It's both a good and bad day for Sharon as she travels from the delights of the mountains to the grim reality of the city and the rain. At least her hair is looking good. Higher Than I've Ever Been In spite of the weather forecasts. In spite of no longer being in The Picos. In spite of Ren being a pessimist. In spite of all this it seems Northern Spain has more delights in store. Magical Kingdom Sharon's having another amazing day riding around Northern Spain. She's on a high, metaphorically and literally. Boots And Burgos Ren is suffering a footwear malfunction and it's time to go and do that city thing. Can Burgos convert Sharon and Ren into city lovers? Burgos Bimble Sharon explores the city of Burgos, Spain. Architecture, stone masonry, pilgrims and tempting food. But can a city really endear itself to this country girl? Lost In Luxury How to turn a fortuitous and splendid day into a nightmare. Just follow Ren and he'll sort the rest out. Still, it could be worse. Dam Lost Fearing the weather Sharon is braced for a drenching. Thing is the weather isn't really the problem. Gritty Northern El Bierzo There's time to explore a different part of Northern Spain today. 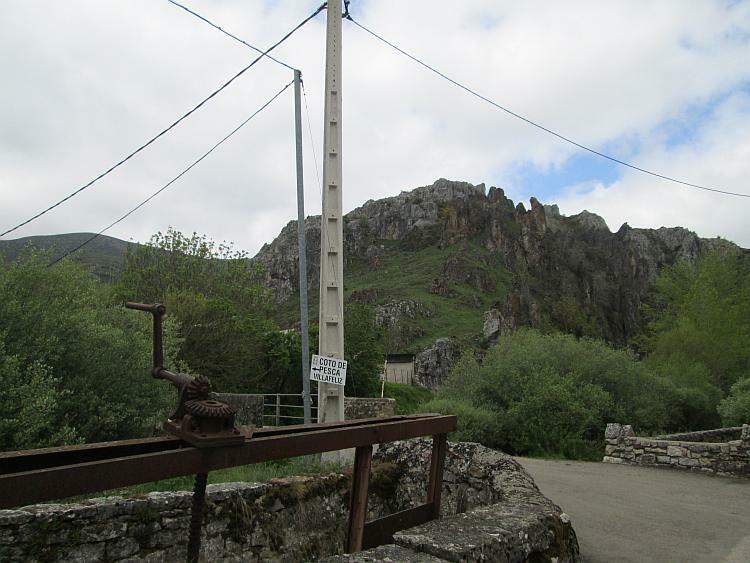 It might not have the beauty of The Picos De Europa it is however a fascinating area. Blink Of An Eye Sharon has an interesting day poking around north west Spain. There's a something of a shock in store for the evening. Back To Beauty, Dodgy Caravan It's time for the dynamic muppets to saunter their way back towards the ferry and Ren is in reflective mood. Wonderful scenery, weird accommodation. The Good, The Bad And The Musty It's a day of confusing emotions for Sharon, but life is for living. Will this evening's accommodation be as luxurious as the previous evening's? Beautiful Potes While going to a now familiar town is hardly intrepid at least it means Ren is calm, chilled out and not lost. For once. Head In The Clouds Sharon is calmed by the wonders of Northern Spain's wondrous scenery as she returns to the comforts of Potes. Sun, Sand, Sea And Santander The weather has improved now it's time for the dynamic muppets to head back to the ferry. Ren is intrigued by stories or walking across Northern Spain, will we see "Walks And Travels" or W.A.T.? Splish Splash Santander The beauty and grandeur of the The Picos means Sharon does not want to leave, ever. It's back to the city, ready to sail home. Fear not, there's still pleasures to be found. The Ferry Home It's the dynamic muppet's last day in Spain so it's time to catch the ferry. A mixture of sadness and relief for Ren, but what about the other riders in the queue? Final Thoughts On Spain Ren crosses the T's and dots the I's on the Spanish trip. I don't know CrazyFrog. Maybe we need to consult our residential Caravaneer Monsieur Soady. I have no doubt he will inform us that his is always warm, toasty and smells like freshly picked roses from a meadow in spring. We must be simple heathens with an ability to always be in the wrong caravan at the wrong time. Told ya CrazyFrog, it is obviously OUR fault. 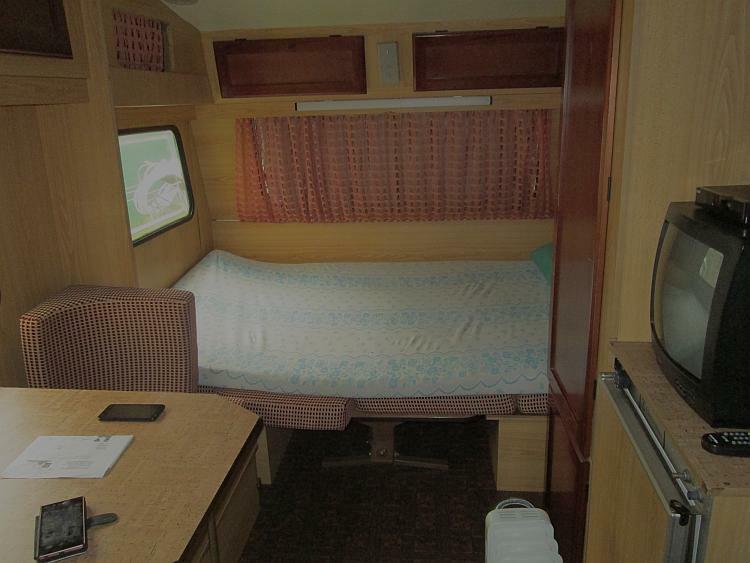 We need a gert big 4x4 with climate control and a roof so we don't the internals of the caravan damp. I can't believe we've been so stupid. My better half keeps on talking about getting a touring caravan when we are both retired. 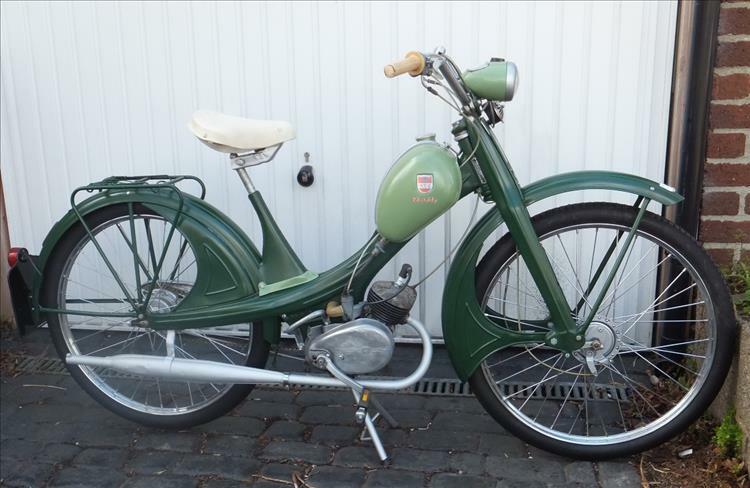 I did restore an NSU Quickly some years ago in the fond hope I could sling it on the back of the car and use it for the morning baguette & croissant run especially where it was too hilly for my normal cycling habit (actually it didn't need to be that hilly!) 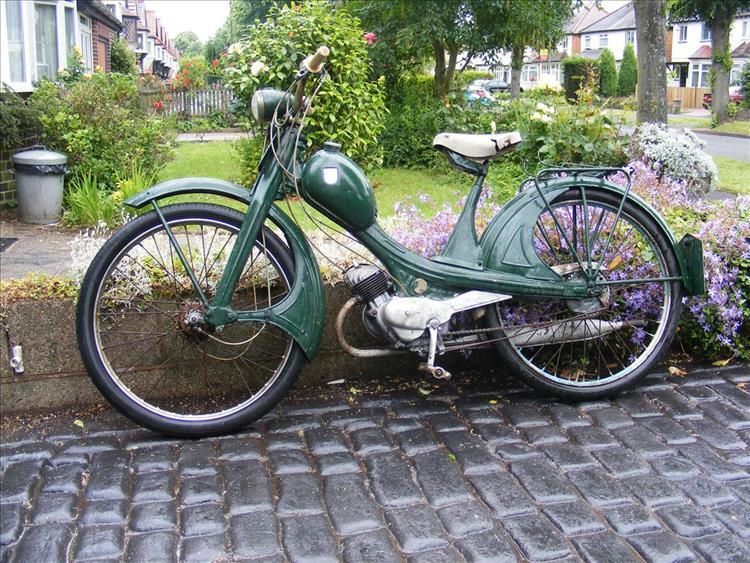 However, once rebuilt it was so gutless I ditched the idea. Eeeehh by 'eck. It's all gone black and white and grainy like an old movie. I can see Henrik in his knee length shorts, collarless shirt and a cloth cap. I suppose that's a bit British, I don't know what the Danes were like back in't day.